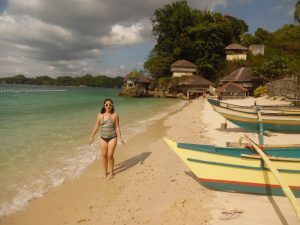 This post was intended to be about Guimaras. 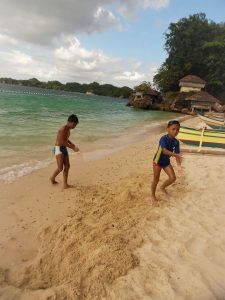 However, seeing ninety-nine percent of our time was spent at the wonderful California Coral Beach Resort at Nueva Valencia, Guimaras, then it seemed right to me to blog mainly about the resort. 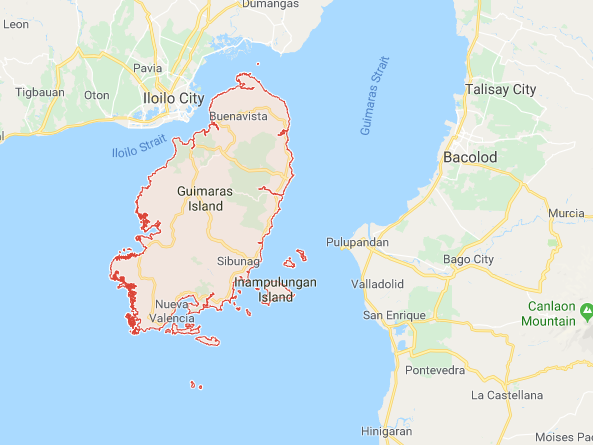 Guimaras Island varies from level to steeply sloping, with land elevation ranging from 0 to nearly 300 meters above sea level. Mt. Dinulman, located in Millan, Sibunag, has the highest elevation of 267 meters above mean sea level. A great part of the island’s land area is above 100 meters above mean sea level. 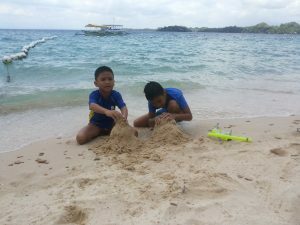 By comparing the topographic features from the 1956 topographic maps with the present situation, it could be concluded that the island’s topography has not been altered much by man-made activities. The island’s topography shows quite steep slopes on the western side of island with plateaus and peaks above 200 m in the central portion. A large part or 37 percent of the total land area is within the 8-18 percent slope, only 4 percent comprises the 18-30 percent slope and 17 percent is within the above 30 percent slope. However, the largest part is still within the 0-8 percent slope range which covers 42 percent of the island land area. The one thing the PIA omits is Guimaras produces the sweetest mangoes in the Philippines if not on Earth. They are simply delicious or namit as one would say in the local dialect. The locals are rightly proud of their mangoes. So much so Robin, our taxi driver on arrival, stopped at a road side stall so we could taste and buy mangoes. Pesos 120 (a little over $2) for a kilo was a bargain as my wife, Zabrina, tells me they are about Pesos 180 in our Bacolod market. I was struck immediately by the beauty and serenity of the island. 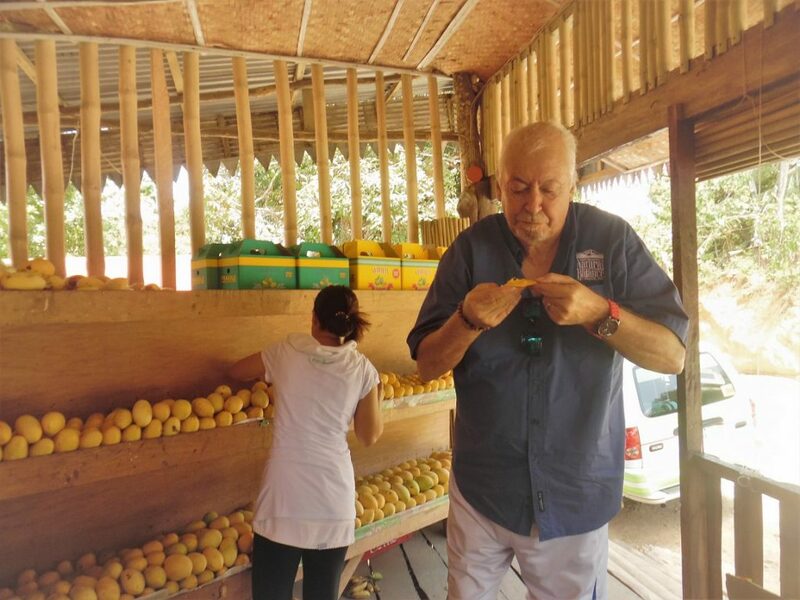 There was hardly any traffic and Robin told me the locals are like the mangoes, the sweetest people. I can believe that. You need to approach this place in recognition of the fact that it’s not just about a beach. Yes, the beach and its waters are good, clear and clean, although it can become rather over-crowded at peak times.So, if you want just to go to Alubihod Beach there are three other places you could stay – some parts of some are just about acceptable to a Westerner, but many parts of all are a shambles of bamboo where things don’t work properly. NOT so at Mike & Lourdes Rainey’s beautiful (and I use the word carefully and deliberately) place. 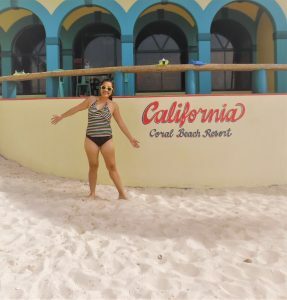 It’s right on the beach, so access is not an issue. The rooms are clean, spacious and finished with an unswerving eye for the detail of fittings and decor. There has been no penny-pinching here: it exudes a confidence in its ability to rise above the rest (literally too) where plumbing, linen and room ambience are concerned. The owners have used their creative abilities to the maximum; these are more than just boxes of rooms with just enough space for the bed that you can find everywhere else. This is different. We were the first to stay in just completed Room 7 which is superb: all the above applies and, since it’s on the top floor, the views of the ocean and neighbouring coastline are far-reaching and mesmerising. 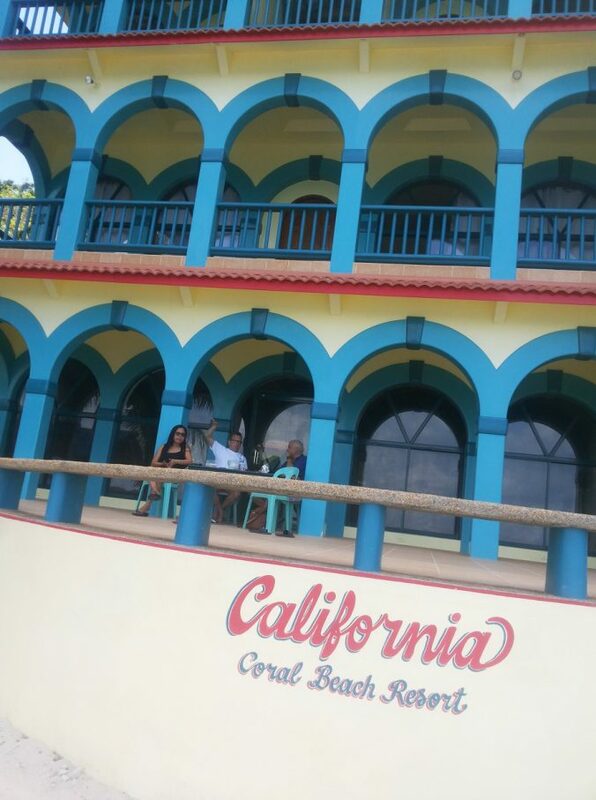 Now, California Coral Beach Resort is a project in progress and for the moment, not all rooms are finished and neither is the restaurant.There is a good BBQ bar with washing-up facilities, tables and so on, so you could move that way – or seek food in a neighbouring resort which will show you just how good this place is. Quality and a concern for detail take time.and when that restaurant is there and all rooms are up and running, it’ll be more than superb. I’d probably allocate 4.8 or 4.9 because it’s not yet finished, but this system doesn’t permit that, so I’m going for 5. That review says it all for me (and it saves a lot of keyboard bashing :)). It is superb and we will certainly return. I will post some pictures so you can see what a beautiful place it really is. Before I do, allow me to comment on the fact the resort’s restaurant is not yet open. It is not a problem. 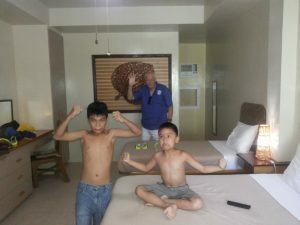 Right next door is Raymen’s Beach Resort. 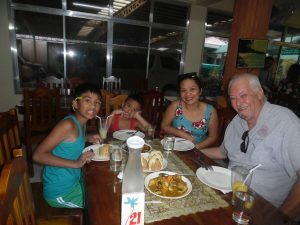 It has a restaurant and the food is fine as well as reasonably priced. Another option is to buy fish direct from the fisher man on the beach. You can grill it on the BBQ within the grounds of California Coral Beach Resort. Problem solved! For details on directions and travel, go to the foot of this post. I nearly forgot to mention how peaceful it is here. No karaoke, no dogs, no roosters! From Bacolod take a ferry to Iloilo. Weesam, SuperCat, and Ocean Jet all run a regular service from the BREDCO port as does Fast Cat from the Banago Wharf. Journey time between 1 hour 15 minutes to 2 hours. On arrival in Iloilo make for the Ortiz Wharf. 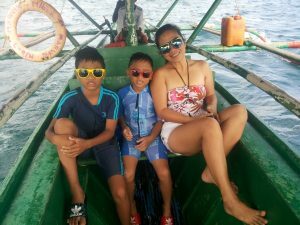 There are regular large banka ferries to Guimaras. Journey time 20 minutes. 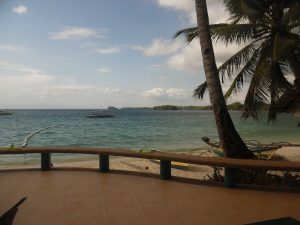 On arrival at Port Jordan, Guimaras, you have a choice of jeepney, tricycle or aircon taxi. We took the taxi and it cost Pesos 600 for a 40-minute trip. Please click the Facebook link above and inquire directly through the resort. 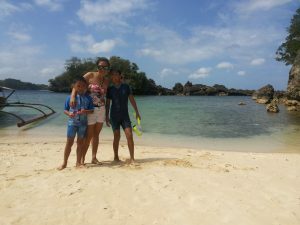 Loved Guimaras! 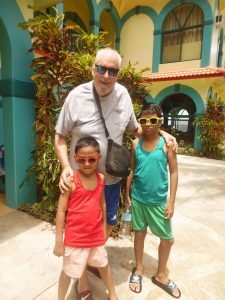 One of the first places I visited when I went to the Philippines. 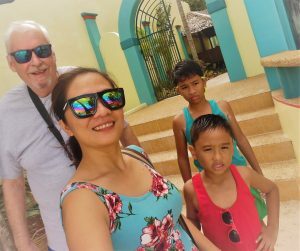 Riding a motorcycle around the coast line, discovering old lighthouses, picking kasoy fruit right off the trees, and those mangos… something I’ll never forget.